Arguably the best docking stand for the iPhone and iPad just got better and more versatile than ever before. The HiRise Deluxe is Twelve South's new and improved all-metal docking stand redesigned with a few fan-requested improvements over the original HiRise including a new gold color and polished chamfered edges. Starting with a more convenient and simplified no-tool adjustment enabling users to slide the rear support backwards or forwards in order to accommodate different types of protective cases using a twist knob at the back instead of having to tighten a few screws on the bottom of the original model. In addition, the HiRise Deluxe features two included color matched charge and sync cables: an MFi-certified Lightning connector cable, and for the very first time a micro-USB connector cable that Twelve South says will let users dock and charge their devices that are encased inside battery cases like Mophie's Juice Pack Air. You'll obviously be able to now use your Android devices with the HiRise Deluxe thanks to the included micro-USB connector, which is designed to fit the HiRise's height-adjustable connector adapters in order to fit into the numerous thicknesses of protective cases. 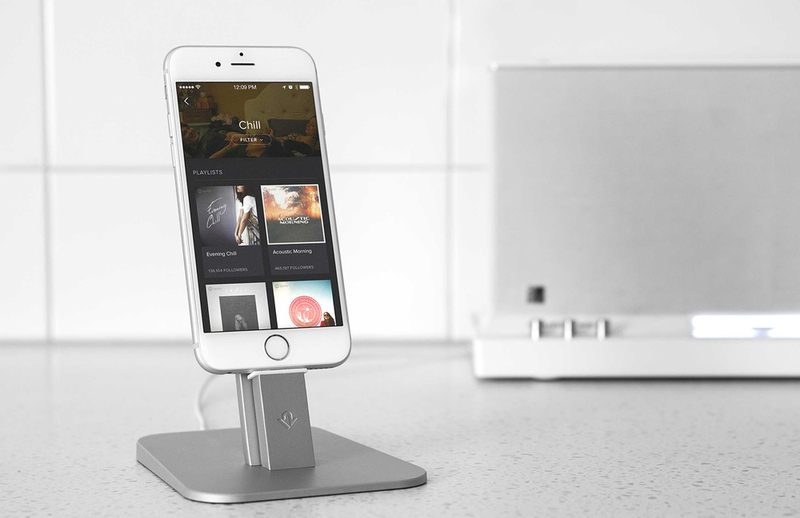 Twelve South's HiRise Deluxe is fully compatible with the iPhone 6, 6 Plus, iPhone 5s, iPad Air 2, iPad Air, iPad mini 3, iPad mini, iPod touch, and unofficially most other Android and Windows Phone devices. It's available right now in silver, black and gold for $60.